We are the fermentation experts in our little neighborhood. We ferment wine, of course, but that’s done with yeast. I’m talking about allowing beneficial bacteria to do their bacteria thang with a variety of foods. Yep, bacteria and food can be an incredibly healthy combination, if done correctly. I’ve even fermented meat to make salami, and my whole family and all my friends ate it and we’re still kicking. I’ll blog about making salami later in the year, though. 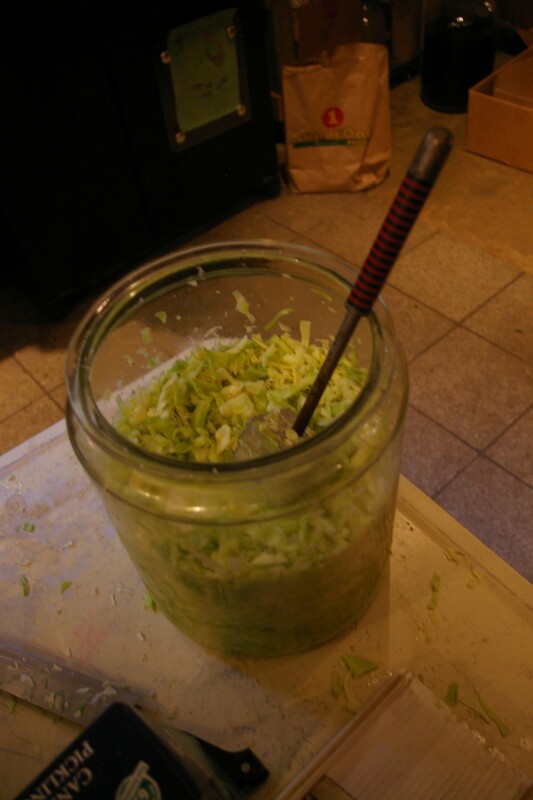 Today we made sauerkraut, a mainstay fermented food that is an absolute must in any healthy person’s diet. It is so easy to make these foods, too, so I encourage you to try your hand at it if you’ve never ventured into this type of culinary joy. No, homemade sauerkraut does NOT taste like the storebought stuff you might have tried. Not even close. Start with a blessing of four little cabbages. Cut out the tough cores and piece into quarters. 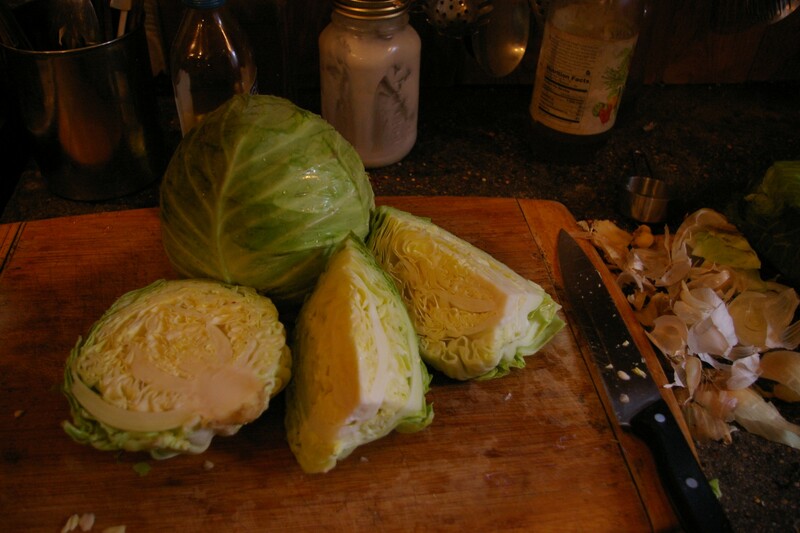 Please pause for a moment and admire the contrasting colors of the cabbage, like the most gorgeous, juicy confetti imaginable. This is real food. This is you creating something healthy. This is you taking care of yourself and your world, preserving the plant so it can sustain you for months to come. Isn’t it beautiful? Now it’s time to smash the cabbage with salt. Old-timers had a special smasher, shaped sort of like a stubby baseball bat, and beautiful five-gallon and ten-gallon ceramic crocks they passed down from generation to generation to make sauerkraut. There is a crock in my husband’s family, descended from Grandma Sylvia, but alas, it lives at someone else’s house. So we make do with a meat mallet (which my husband made in shop class back in high school) and a large glass jar. Throw in four big handfuls of shreds, sprinkle with salt. There’s a legend that the smallest child in the family would hold her hand open and the mother or grandmother would fill the child’s palm with salt to get the right measurement. Use your imagination to guess how much that might be, if you happen to not have a small child nearby. By the way, please don’t use salt that has stuff added to it, like aluminum. Aluminum and other heavy metals have been linked to increased risk for Alzheimer’s and Parkinson’s diseases, and while there are several essential oil protocols/supplements that help to remove heavy metals, isn’t it just better to avoid them if you can? Yes, you could use sea salt or pink Himalayan salt, if you have some lying around, but plain pickling or kosher salt will do fine. 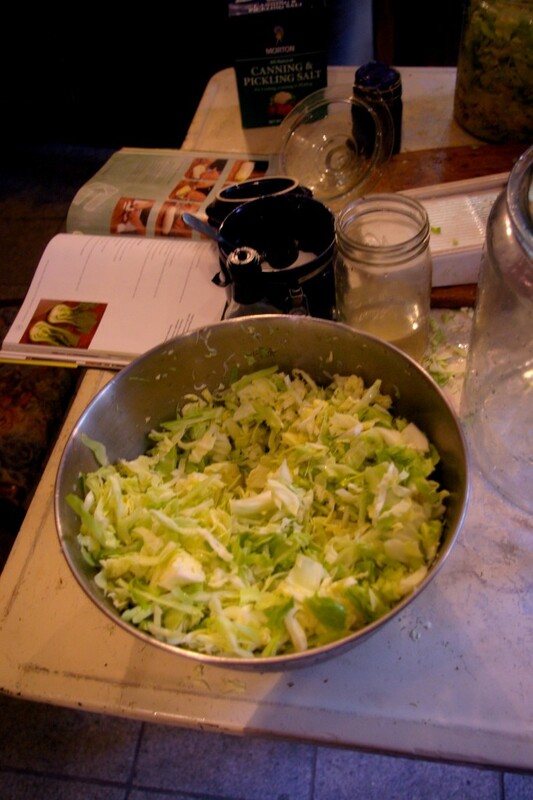 Continue layering four handfuls of shreds with your guesstimate of salt and keep smashing until you have used all four cabbages. You will smash until the shreds are submerged in their own juices. DO NOT under ANY circumstances add water!!! If you get tired, rest for a few minutes or ask for help. Then smash some more. 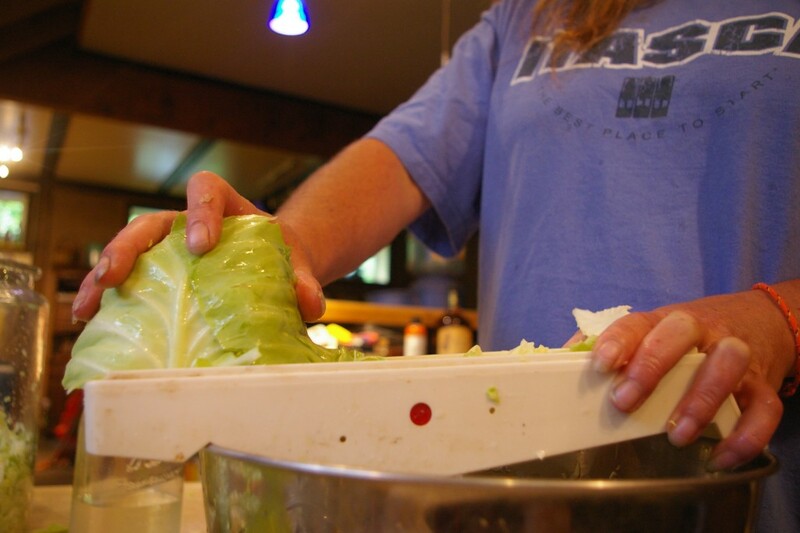 Finish up this part of sauerkraut-making by topping it off with a few whole cabbage leaves and placing a quart freezer bag filled with water on top to keep it all submerged. Cover the jar or crock with a towel and the lid, and tuck away in the pantry. Please leave it alone and don’t stir, don’t take the lid off to check, etc. You want to keep oxygen out of the process. You have not actually made sauerkraut yet. Right now, it’s cabbage with a lot of salt. The real fun begins when the good bacteria wake up and start perking away, which usually takes between three and seven days. The kraut will “work” for another five to six weeks (yes, weeks), and try to keep it between 60 and 70 degrees. It bubbles and pops and generally has a 24-hour party until everything settles down and it is finished transforming into the food of the gods. 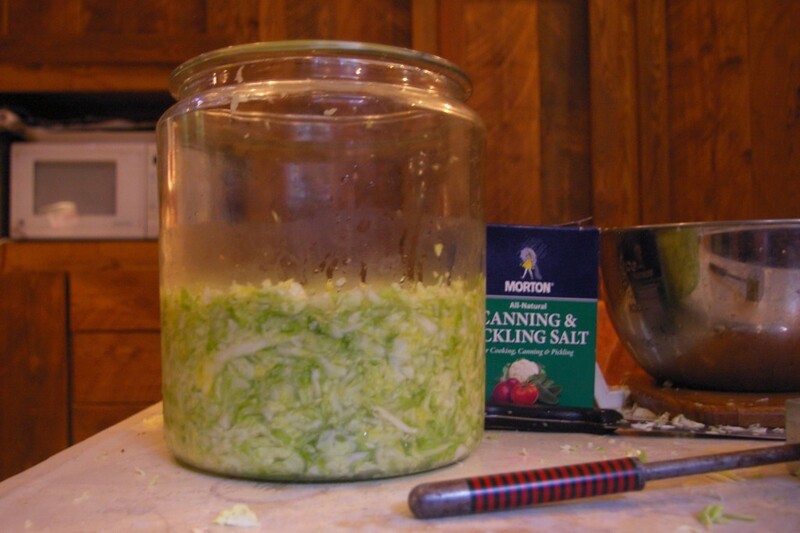 By the way, you may start to worry at certain points during the fermentation if you’ve never made sauerkraut before. White scum will form on the surface, and those are happy yeasts that provide even more probiotic joy. If it grows a funky black and purple mold with long mold threads running down into the sauerkraut, that means you used too much salt, had too much oxygen in the jar, and/or your fermentation space was too warm. Throw it out and start over. If the kraut turns pink, you used too much salt, so throw it out and start over. There will be a crusty and somewhat soft layer on the top when it’s finished working, so when you go to store the sauerkraut in the refrigerator scrape that off. Good kraut should squeak when you bite into it. At this point, you’ve made the best source of probiotics that can be made in a home kitchen with no special equipment. 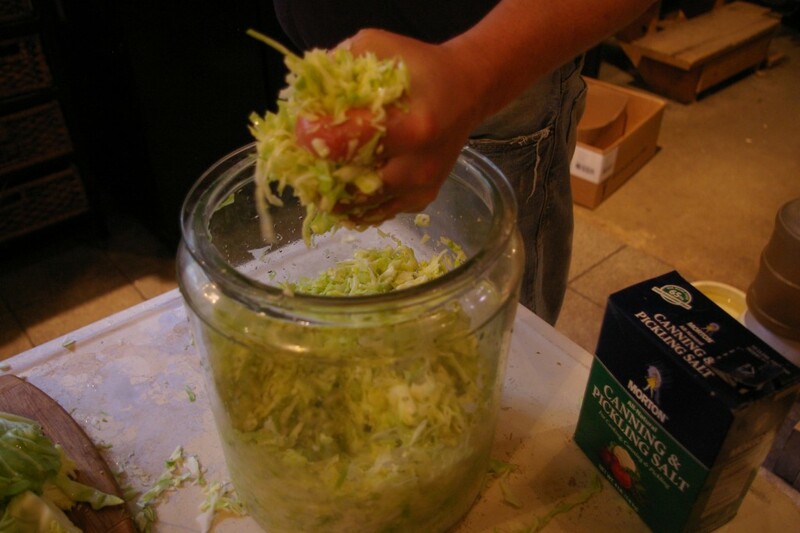 If you choose to can the sauerkraut, you will kill the good bacteria and a lot of the health benefits. If you freeze it, same thing. We simply move the finished product into quart mason jars and store in the refrigerator, preserving all the love that nature can offer and making our guts very, very happy for months to come. We also made kimchee, but that deserves its own blog post because it’s a somewhat specialty probiotic product. I’ll crosslink the two articles together later so you can read them both.